New Glass C200 is Lenovo's first entry in augmented reality smart glasses promising both AI and AR experience with a monocular design similar to a Google glasses. Its AI technology can recognize real life objects. Working with Linux Operating system and with a Pocket Unit staying at one eye side on its case, C200 smartly connects itself through New Glass App. Lenovo NBD Martin, an AI recognition software which collects and analyzes data from camera and sensors, helps a user get a better experience on the work. It also aims to combine all information through user's voice commands, gestures, and selections which enable extremely productive experience to commercial, business users including workers. 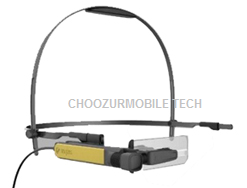 C200 is expected to arrive soon in months and will face competition from Apple, Vuzix M300, ODG R7 and Epson Moverio.